Months went by. But walking past it on my way to Guisborough one day, I had some time and examined the whole structure. I took photos on my old phone, turned off the road, down through the bushes and up to one of its piers. Then it happened. I climbed up the eastern end and onto the deck. There I saw trees growing over the handrails and roots displacing its stonework. I found myself consumed by an incredible sense of injustice. ...taken on his old camera phone. From that day until December 2011, preserving this beautiful, once vitally important but now neglected piece of industrial heritage was never off my mind. Never. Every email, every hour spent poring over dusty books in the library, squinting at old OS maps, typing and re-typing keywords into search engines, then spending hours sifting through the results and the websites beyond ‘til my eyes refused to focus anymore. The anxiety about whether I would be too late - would I go back one day and find it demolished? The mesmerising wealth of information on the ironstone industry and the railways that once serviced it - all now long gone from the landscape. The excitement of receiving replies from people who shared a common interest and using the information within to enhance both my personal knowledge and my application to get the viaduct listed. And the email I eventually received from Peter Rowe of Tees Archaeology, informing me that I’d been successful: that was the best feeling of all. Ever. This is how I achieved it. The Cleveland Railway in north-east England ran from Normanby near Middlesbrough, via Guisborough through the Eston Hills, to Loftus in East Cleveland. It carried minerals from numerous iron ore mines along its route to the River Tees for shipment to Tyneside and elsewhere. The line was an offshoot of the West Hartlepool Harbour and Railway on the north bank of the Tees, to which it had a cross-river connection via a jetty at Normanby. It was built as a freight line and provided no passenger services during its brief existence as an independently owned railway. The route was progressed in a number of stages, bypassing the centre of Guisborough, and opened in November 1861. 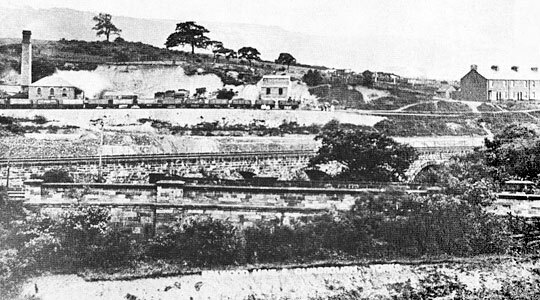 Its construction was repeatedly held up by disputes with its main rival, the Stockton & Darlington Railway, which unsuccessfully attempted by every means at its disposal to maintain its rail monopoly south of the Tees. However, the Cleveland Railway remained independent only until 1865 when the company and its rivals were bought out by the North Eastern Railway. An 1894 map showing the various lines at Slapewath, with the viaduct labelled to the left of Slapewath Junction. The new management linked the line with an existing coastal route via Saltburn, running north of the Eston Hills, and closed the line west of Guisborough in 1873 after only 12 years of service. The NER also constructed four passenger stations at the eastern end of the line in the 1870s. These were closed between 1958-1964, along with the section of line from Guisborough to Brotton, but the easternmost part is still in use today for mineral traffic. Why did I want it listed? I started off determined to preserve Slapewath Viaduct purely as a piece of history, one that very few people left alive have ever heard about, let alone seen. Most people who travelled over it as passengers on trains are over 60. To have clear memories of 1960 you’d have to be born by 1950. Every time I mentioned it to someone, they didn’t have a clue what I was jabbering on about which I found the most infuriating part. To me, I’d found a beautiful historical relic and wanted everyone not only to know about it but also to see it. People - including my girlfriend at the time - just smiled, said “great” and then gently changed the subject. It felt like it was just me and my viaduct against a world filled with indifference - neither my friends nor ‘the powers that be’ seemed to care about it at all. Why didn’t the Cleveland Way go over it? Why was it in such a state? Why wasn’t it easily accessible to the public? The only people who used it were abseilers and the occasional walker who saw the public footpath sign at nearby Fancy Cottage and took the chance. Even the cycle path from Guisborough came to an abrupt end just before Spawood Junction and diverted riders onto a cycle path alongside the A171 which didn’t seem to make sense or be very safe. Why? I started asking questions and searching the internet. The first organisation I contacted was the Northern Viaduct Trust. Just a general enquiry about what I had to do regarding the process of preservation. Mike Sunderland was absolutely brilliant and not only replied with a comprehensive checklist of what I should do next, but also a description of how they had preserved all of their structures near Kirkby Stephen. The insight from that one email was enough to fire me, not only in the right direction but also exactly what to do along the way. 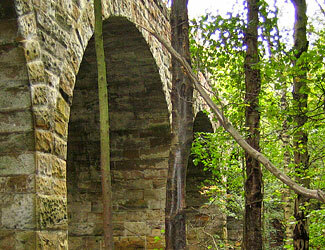 Check out the NVT’s website for some truly stunning viaducts. From there I set up a Facebook page, Friends of Slapewath Viaduct (requires Facebook account), which I used to post photos and generate discussions. Friends joined, some gave me information but generally it was to focus my thoughts on the job in hand. Emails to my local conservation officer, Graeme Bickerdike at Forgotten Relics, Sustrans, English Heritage and the like, led to other people giving me additional, valuable information. Ownership, date of construction, date of closure among other issues were discussed and, in the majority of cases, resolved. 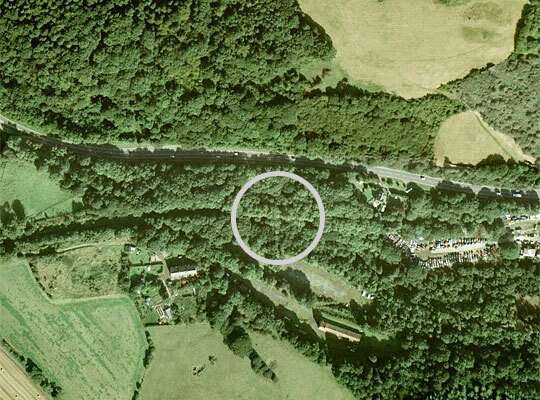 The viaduct is not visible on aerial photography but can be located by the line of lighter coloured trees in the circle. Research turned up an incredible history of how the railways spread from Middlesbrough all the way over to the mines in East Cleveland. Finding out that Guisborough once had two competing railways, using two different routes with one crossing the other behind what is now the town’s sorting office, was at times difficult to comprehend. The when, why and hows took a long time to sink in. It’s too long to recount here but the battle between the Cleveland and the Middlesbrough & Guisborough railway companies during the mid 19th century are both fascinating and, sadly, little known about. Well worth researching though if you live within 10 miles of Guisborough! The most interesting research turned up the structure of the Cleveland Railway in the vicinity of Slapewath and Spawood mine. The realignment of the A171 in the late 20th century had obliterated the old road; the bridge to Skelton pit was demolished before the Second World War and the road bridge over the lines actually in Slapewath was buried and now forms part of the Cleveland Way adjacent to the shale quarries on the north side of the A171. The cat’s eyes in the path are all that remain to remind walkers of its use as the main road between Guisborough and Whitby. How did I get it listed? The process started by downloaded forms from English Heritage’s website. They are easy to fill out. If you’ve done your research and know all there is to know about the building or structure, fill in the basics in legible handwriting, print the additional information out and attach. Write a full and accurate description of it and as many valid reasons why it should be preserved. Saying it looks nice or the place won’t be the same without it probably won’t work. 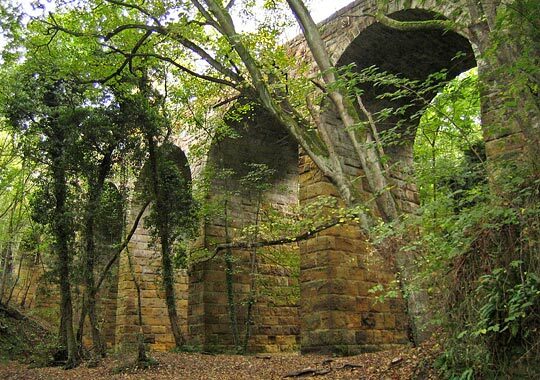 My argument was that of all the railway viaducts in East Cleveland, Slapewath is the only surviving one of stone construction and was built between 1858-62, long before the Whitby Redcar & Middlesbrough Union Railway viaducts between Loftus and Whitby. Kilton Viaduct was buried under mine spoil around the turn of the century after subsidence, whilst those at Staithes, Sandsend, East Row, Newholm Beck and Upgang were sold for scrap in 1958-1960. The nearest stone viaduct would have been Thorpe Thewles but, guess what, it was blown up in 1980. The only one left is Saltburn Viaduct which is brick and still operational. I also included a land registry search, current OS map with grid reference and an old map taken from one of the many mapping websites. Obviously the location of the viaduct was highlighted together with the relevant junctions. An aerial view from Google Earth also showed its position but the viaduct is obscured by trees. All good for reference though. The following text formed part of my application. 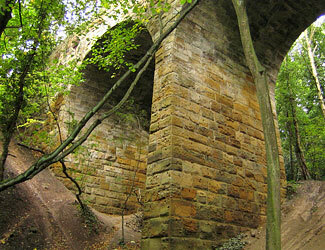 Built in 1858-1862 as part of the Cleveland Railway, Slapewath Viaduct ran over Spa Gill as the track passed through Spa Wood to transport ironstone from local mines such as Spa Wood, Skelton Shaft, Skelton Park Pit and Waterfall to Normanby jetty on the River Tees at and the furnaces alongside. Amalgamated with NER about 1863. Closed on 30th April 1960. Last train was on 2nd March 1964 which was an inspection by the Chief Civil Engineer to Teesside. Bridge number and dimensions are GUH1 Br No 7 @ 10m 63ch. It is 20 metres south of the A171 (Fancy Bank) slightly left of a car recycling business. It is easy to spot because the strip of trees on the bridge deck is a different colour on an east-west axis. Slapewath Viaduct (engineers reference GUH1/7) was sold to Mr & Mrs Frankland-Jones by BRB(R) on 12th September 1972. There was a Frankland-Jones on the Electoral Roll in Guisborough in 2002 but after then there is no record. Charles Morris, Chairman of the Cleveland Industrial Archaeology Society, through third-party correspondence thought it was most likely to be part of Lord Gisborough’s estate but others have inferred that it may be owned by Skelton & Gilling Estates. Enquiries to both proved fruitless. I understand from my engineering colleagues that notification of demolition of the viaduct would not be required. The notification/approval system apparently applies to buildings rather than structures. I also understand that while the notification system is in the public domain, and therefore accessible to members of the public, there is no requirement to publish notifications. This is probably because the system relates to public safety rather than a concern for buildings. An enquiry through the Land Registry also provided little information as the 13 properties listed were cottages, farms and one saw-mill. Other enquiries merely stated that the land was freehold either side of the Whitby road in the general location of the structure. It also seems, apart from approximately 20-30 assorted photographs, no-one has published a history of the structure. 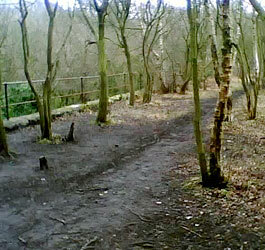 Even less in evidence is anything regarding the bridge that at one time crossed the Whitby Road to Skelton Park pit, the junction of which has remains adjoining the eastern end of this structure. Please find enclosed numerous photographs taken this year of both the structure’s exterior and the condition of the deck, a Google Earth photo with the approximate location of the structure highlighted and an OS map excerpt from 1926 showing the old alignment with coloured box to show the position of the structure and also the aforementioned Land Registry enquiry. It is over 150 years old. 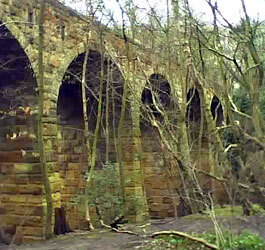 It is the only disused viaduct of stone construction in East Cleveland remaining. Larpool and Skelton (both listed) are constructed of brick. There are bridges further to the west which form part of the structure of the disused railway between Guisborough and Boosbeck that have been listed. They would seem to be architecturally inferior and of less historical interest. Slapewath Viaduct has a very important place in the history of both ironstone mining and the development of the railway network in East Cleveland. Except for the two structures above, all the rest have been dismantled or are in a very poor condition. Upgang, Newholm Beck, East Row, Sandsend and Staithes viaducts were sold for scrap 50 years ago and the tunnels at Sandsend and Kettleness are in a very poor condition. I hope this application is satisfactory as this wonderful structure caught my imagination a few years ago and is never far from my thoughts. It would be a great loss, not only to the people of East Cleveland today but for future generations, eager to learn how Cleveland ironstone was transported to the Tees and therefore how Gladstone came to describe Middlesbrough as an ‘Infant Hercules’. The main problem I encountered was determining the structure’s owner. Numerous emails, books and websites returned no useful information in this regard. The one stroke of luck was Graeme at Forgotten Relics who did some research and turned up the BRB(R) information regarding it being sold to Mr & Mrs Frankland-Jones in 1972. Even English Heritage had initial difficulties but they must have discovered the information in the end. Access was limited as rights of way were confusing to say the least. During numerous visits over the past few years the only people I ever saw were on trials bikes. Hopefully that should change in the future. ...but photographing the viaduct is difficult due to the trees that surround it. Trees hindered photographing the structure. Even in winter, without their leaves, the surrounding vegetation made long range photography very difficult. Maybe in the future, if the viaduct is cleared, this might also be thinned but hopefully not to the extent of encouraging erosion by both water and people enjoying the view. It was a long walk! I live in Marske so it is a long way via Tocketts Mill, Mucky Lane and Waterfall corner, especially during inclement weather. Seeing the viaduct in the trees made it all worthwhile. In all the years of my limited research I found no more than 30 photos of the viaduct. The main source was my own pictures taken at different times of the year. Books, the internet, map websites (especially New Popular Edition (NPE)), Google Earth, Wikipedia, NER Encyclopaedia and the National Archives in Kew all proved invaluable. A very useful website is Closed Stations, part of the Subterranea Britannica site. I spent hours looking at photos of how the local lines and stations used to look. Incredible stuff! It also unearthed other lines at Cod Hill Junction, Upleatham Junction and of course the least known railway of all which is Paddy Waddell’s - the proposed line from Moorsholm to Lealholm which was never built at the end of the 19th Century. I only found one book that described this route. Friends and colleagues were the worst - no interest at all really! The council was uninterested and Sustrans proved helpful at first - asking to schedule a meeting - but then nothing. I wonder what the owner thinks? Did I ever feel like giving up? No, never. After the application went in, the main cause for concern was that it would be turned down. Day after day looking in my Inbox for anything from English Heritage didn’t help feelings of anxiety. If it had been pulled down after I’d walked away I would never have forgiven myself. Would I do it again? Yes, hopefully this year. I’m just deciding what I’d like to preserve. Crimple Low Viaduct in Harrogate looks a possibility. It might be disused and a bit creaky but it’s a spectacular structure - everyone raves about the nearby Crimple High Viaduct but overlooks Crimple Low, which is unfair. Would I advise others to do the same? Absolutely - do it right now! Get down to your library’s Local History section and do some research. Download the application forms from English Heritage and crack on. You won’t regret it. Richard's efforts should ensure that Slapewath Viaduct will be protected for future generations to marvel at. A chance encounter with a hidden, neglected piece of history - and a great deal of help from friends and acquaintances - not only instilled pride about where I live but it also changed me as a person…for the better. Photos of Thorpe Thewles Viaduct will always remind me why I did this. Once it’s gone, it’s gone for good. Overlays 1920-30 maps over contemporary versions. OS mapping from 1940-50, showing Slapwath. A historical overview of the nearby Boosbeck Station. Forgotten Relics' page about this NVT structure.